*Note: This is part two of a two-part story. You should have read Before That Night prior to reading this. Some spoilers for that story ahead. 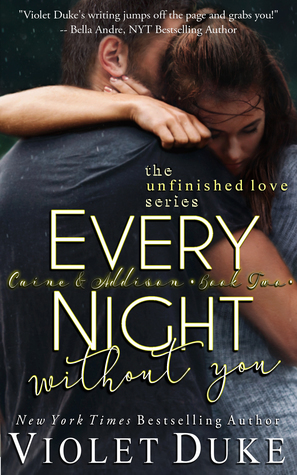 Every Night Without You is the conclusion to Caine and Addison's story. If you read Before That Night then you know Addison is a sweetheart and Caine is wonderful with her and her siblings. I will admit that it had been so long since I read the first book I didn't remember exactly what happened, but you get all that info in here so I caught up pretty quick. Caine and Addison have been living apart for seven long years. They have not seen each other or spoken to each other in that time. It is hard for both of them as they were in love. Still are, but Caine needs to make sure Addison will be safe before he can try and find her again. He has been working as hard as he can to catch her stalker, but the stalker is always one step ahead of Caine. When Caine sees Addison one day that is it. He can't stay away anymore, especially since he knows where she is. He has missed too much of her and her siblings lives already. He doesn't want to miss any more. Only he can't just be obviously involved or her life might be in danger. Her stalker was pretty crazy so...they have to be careful. And Addison tries to stay away, tries to just be friends, but with the two of them that just won't work. I loved it. They were awesome together. Addison is still such a sweetheart, always putting the needs of others before her own. She has really done some amazing things in the past seven years. Really made a difference in a lot of people's lives. I loved her, and Caine was just as awesome. They totally work together so it was nice watching them try and figure everything out. How can they be together, but still keep everyone safe? These two don't have the easiest road to follow, but they never give up. There are a few twists and turns in there, a few things I wasn't expecting, which made this read lots of fun.